Yorkshire Terriers make your life full of joy. We are breeders of AKC yorkshire terrier puppies. Yorkie Puppy's available throughout the year. Our Yorkie pups range from 3 1/2 to 7 lbs grown. We have some champion sired Yorkshire Terrier moms and dads here and will be tring to produce the best quality Yorkshire Terriers that we can. Our Yorkies come with shots and all Vet records. Yorkies have tails cut and dewclaws removed. Last boy all our baby yorkies will come pre-spoiled. We love raising our South Carolina yorkies . They are the joy in our lives. Yorkshire Terriers are very smart and are beautiful and make great companions for anyone. Yorkshire terriers are like people they all have different personalities and we strive to help them to develop into healthy adults. We give each of our yorkshires a good start in life so that they will live long and happy and healthy lives. You can view some new and some past yorkie babies throughout the site, also some of our sires and dams. Maybe you can learn a little about our breeding program also. Go to our contact page to speak with us if you are interested in or have questions on any of our site. We have many champion blood lines in our yorkshire Terriers pedigree. We are breeders of yorkshire terrier puppies only, we devote all of our time to this single breed. Thank you for visiting our site. We do not sale our Yorkshire Terriers to Pet stores or to massive breeders. We like to place our yorkies to moms and dads who will love and be loved in return, ONLY!!!!!!! As I've said we are small breeders and our intention is to help further the breed not lose it all togeather. You willl see throughout my site that I mention tiny yorkie puppies. That is just a cute term for the smaller pups. I do not consider 5 pound dogs as tiny yorkies, so when I refer tiny yorkies they will be small and will be sold on a limited registration basis only. They are far to tiny to breed. The male Tiny yorkies can be bred, but not the females. Go to my yorkshire terrier puppy page to see available babies. I have yorkie puppies for sale North Carolina, also in South Carolina. I just do not ship my babies, but other arrangments can be made sometimes for anyone who is interested. I do not limit my placements in these areas only, but I just do not ship via cargo. I have placed my yorkshire terriers in South Carolina, North Carolina, Georiga, Tennessee, West Virginia, Florida, and Missouri. yorkshire terriers for sale,yorkshire terrier puppies, akc yorkshire terrier puppies for sale north carolina, Tennessee yorkies, Florida yorkies,Virginia, Texas, Maryland, Mississippi, Alabama, Missouri, Illinois, Kentucky, Georgia, New York, Ohio, Arkansas, Michigan, New Jersey, Pennsylvania, Illinois, Indiana, Delaware, Connecticut. All our yorkshire terriers are AKC. I also have baby doll yorkshire terriers in Canada. Thank you to my friends in Canada. Click heart below for informative site on Yorkshire Terriers and pet health Insurance . Yorkshire Terriers are a great addition to ones life. Yorkies are a life time of joy, they are a lot of fun and are very smart. I love their baby doll faces and thier big personalities. We are breeders of quality Yorkshire Terrier puppies. We only breed Yorkshire Terriers so we can learn more them and them alone. I soon will have puppies that will be show quality with very impressive lines. All yorkies are AKC. Our kennel name Daisy Field Kennel came from our beautiful grand-daughter who we lost to a heart defect in 2005. Check out Savannah's page.This is the poem she wrote on the day she passed. If I were a seed I would be a Daisy. I would live by myself. I would grow in the spring with sunlight. I will grow with water, soil and sunlight. I would live in a garden of Daisys. I would watch the sunset go down. I am around at valentines day. We have akc yorkshire terrier puppies for sale. Tiny baby doll face yorkies 4 pounds and under, and small 4 and to 7 pounds. We are hands on breeders of yorkshire terrier pups. Our little yorkies are never left to fend for themselves, we are a 24/7 caretakers of our babies. Our dogs have inside and outside runs, but they really like our bed best. A lot of the time there is no room for us humans. We have champion pedigree yorkshire terrier puppies for sale in South Carolina, and North Carolina. We are small breeders of yorkshire terrier puppies. We do not sell our yorkie off spring to pet stores, only to private homes. We seek homes for our tiny baby doll face yorkie puppy's who will be excepted as a member of the family. We thank of our yorkshire pups as our children with four legs. Grooming is a big part of our lives. Yorkshire terriers hair is a lot like ours, so I like to do for them as I do for myself. I love to brush my pups hair. I start when the puppy is very young so they learn to look forward to grooming day. You can keep your yorkies hair cut short if you don"t like to brush often. This is called a puppy cut. I keep some of my females in a puppy cut when they are nursing, because it is easier to manage at that time. As breeders of yorkshire terrier puppies we strive to create well balanced and socialable little pups. We have tiny yorkie pups for sale. Most under 5 1/2 pounds as adults. Our yorkie babies go home with a goody bag full of things you need to help keep your yorkie baby happy and healthy. We at times have tiny baby yorkie puppies available, which will at adult weight be around 3 to 4 pounds. The smaller the size of the yorkshire terrier or any other breed should not be placed where there are small children who could step or fall on the puppy, the tiny yorkie puppies will not be placed where there are young children, the over 4 pounds can be placed in these homes. 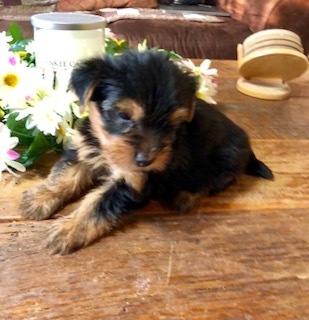 We have yorkshire terrier puppies for sale South Carolina. We have yorkie puppies for sale North Carolina. Our yorkshire terrier puppies for sale in South Carolina come fully guaranteed to be pre -spoild and healthy. We have sires and dams that are champion sired. Our yorkshire terrier puppies in South Carolina are home bred and loved by us. 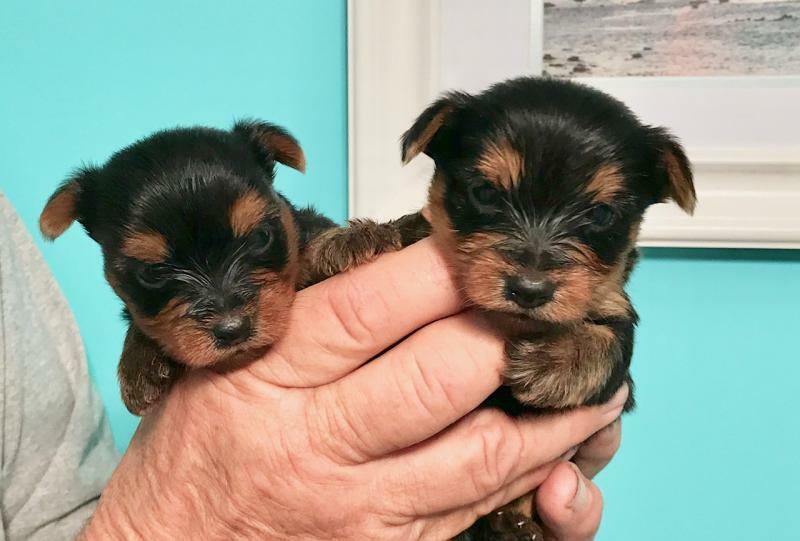 What we offer here at Daisy Field Kennel is quality yorkie puppies, Akc yorkshire terrier puppies for sale in South Carolina,both male and female yorkie pups. Limited and Full registration on our yorkie puppies. Yorkshire terrier puppies in South Carolina are raised in ou home. Champion pedigree yorkie puppies. Pet quality yorkshire terrier puppies. Breeding rights on some of our yorkshire terrier puppies. Only healthy yorkie puppies ever leave our home. Our tiny toys are seen by our Vet at least three times before they leave for thier new homes. Our champion sired moms and dads are our pride and our babies. We do supply delivery to South Carolina, North Carolina, Florida, Georiga, and Tennessee for and additional fee. We have Yorkie puppies for sale in South Carolina. We also have yorkie puppies for sale North Carolina. We place most of our babies in North Carolina, South Carolina, and Florida, because we do not ship our offspring. We are breeders of quality yorkshire terrier puppies. Yorkshire terrier puppies in South Carolina with AKC champion sired moms and dads. we now have akc champion sired sire in our breeding program. We have a AKC champion sired dam also that we will be breedin next year. We are breeders of quality yorkshire terrier puppies. Yorkshire terrier puppies with baby doll face yorkies. Some of our baby doll face yorkies have moms and dads who are AKC champion sired with great pedigrees.